Palak Pnaeer is a popular North Indian curry made of blanched spinach and paneer /cottage cheese. 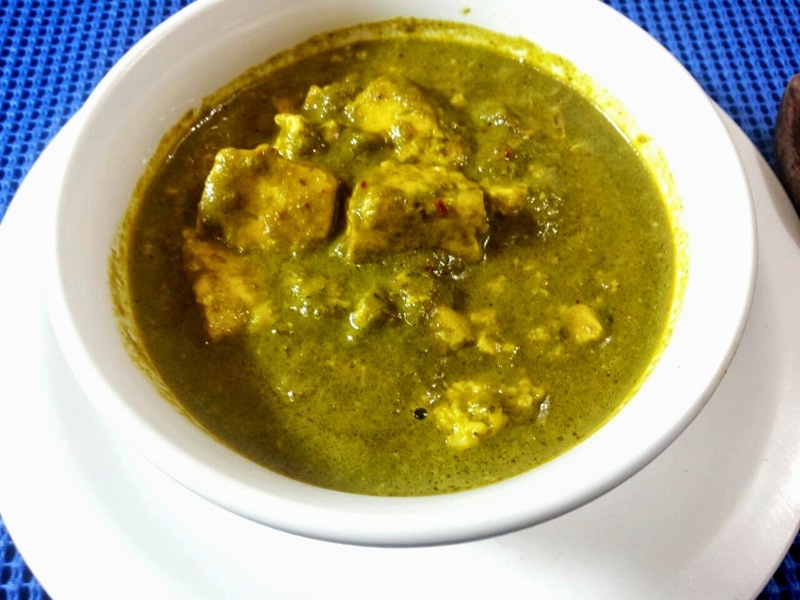 This combination of spinach and cottage cheese is highly nutritious.It is recommended for kids especially.Usually kids dont like spinach including my four year old.This dish allows me to play hide and seek by hiding paneer cubes in palak gravy.This recipe is quite fuss free and hence a great choice for all working moms.Nutrition and taste both together. Add spinach leaves and salt to boiling water(in a pan).Cover the pan with lid and let it cook on medium heat.After 5 minutes,drain water and immediately add spinach to a bowl of cold water so as to stop cooking process. This method helps in preserving green colour of spinach.Let it rest for 2 minutes. Drain cold water.Add spinach to mixer and grind it to make smooth puree.Usually water is not needed in the mixer. Take a thick bottomed pan.Add oil to it.Add cumin seeds and let them splutter. Add onion paste and saute it brown.Now add ginger garlic paste .Saute them till raw smell of garlic goes away. Add tomato puree,turmeric powder,red chilli powder,coriander powder and water to the pan.Stir well. Once this is done,add palak puree and let it simmer for 6 to 7 minutes on high heat. Add garam masala followed by salt. Stir again and add paneer cubes to the mix.Let it simmer for 2 tpo 4 minutes. Lastly add cream,stir gently and take it off heat.Serve hot with Indian flatbreads .